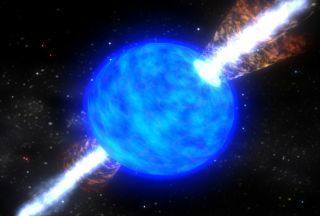 Gamma-ray bursts from distant stars, as shown in this artist's illustration, are one possible source of the ultra-powerful "OMG particles" that occasionally hit scientists' detectors on Earth. Paul Sutter is an astrophysicist at The Ohio State University and the chief scientist at COSI science center. Sutter is also host of "Ask a Spaceman" and "Space Radio," and leads AstroTours around the world. Sutter contributed this article to Space.com's Expert Voices: Op-Ed & Insights. Right now, as you read this very text, your DNA is getting sliced up by tiny, invisible bullets. The damage-dealers are known as cosmic rays, even though they are absolutely not rays — but the name stuck from a historical misunderstanding. Instead, they're particles: electrons and protons, mostly, but occasionally heavier things like helium or even iron nuclei. As if this wasn't bad enough, every once in a while, roughly once per square kilometer per year, a particle comes screaming into our upper atmosphere at truly monstrous speed, knocking against a hapless nitrogen or oxygen molecule and cascading into a shower of lower-energy (but still deadly, of course) secondary particles. There's only one appropriate response when confronted with a particle of such preposterous potential: "OMG." "OMG" was the nickname given to the first example of what are now known as ultra-high-energy cosmic rays, detected in 1991 by the University of Utah's Fly's Eye cosmic ray detector. That single proton slammed into our atmosphere going roughly 99.99999999999999999999951 percent the speed of light. And no, all those nines aren't just for dramatic effect to make the number look impressive — it really was that fast. This particle had the same amount of kinetic energy as a decently thrown baseball … compressed down into an object the size of a proton. That means this particle had over 10 million times more energy than what our most powerful particle collider, the LHC, can produce. Due to relativistic time dilation, at that speed, the OMG particle could travel to our nearest neighbor star, Proxima Centauri, in 0.43 milliseconds of the particle's own time. It could continue on to our galactic core by the time you've finished reading this sentence (from its own perspective). Since that particle's detection, we've continued to watch the skies for these extreme events using specialized telescopes and detectors across the world. All told, we've recorded around a hundred of the OMG-class particles in the past few decades. Those few dozen examples both elucidate and deepen the mysteries of their origins. More data is always good, but what the heck in our universe is powerful enough to give a proton a good enough crack that it could almost — almost — challenge light itself to a race? To accelerate a charged particle to insane velocities, you need two key ingredients: a lot of energy and a magnetic field. The magnetic field does the work of transferring to the particle whatever energies are in your event (say, the explosive kinetic energy of a supernova blast or the swirling gravitational pull as matter falls toward a black hole). The detailed physics are, naturally, incredibly complicated and not very well-understood. The birthplaces of cosmic rays are frightfully complicated and located in extreme regions of our universe, so a complete physical picture is going to be hard to come by. But we can still make some educated guesses as to where extreme examples like our friend the OMG particle come from. Our first guess might be supernovas, the titanic deaths of massive stars. Magnetic fields? Check. A lot of energy? Check. But not quite enough energy to do the trick. Your garden-variety stellar detonation just doesn't have enough raw oomph to spit out particles at the speeds we're considering. What's next? Active galactic nuclei are strong contenders. These nuclei are created as matter swirls to its doom around a supermassive black hole situated in the center of a galaxy; that material compresses and heats up, forming an accretion disk in its final moments. That twisting inferno generates intense magnetic fields from dynamo actions, forming the potent mixture of ingredients necessary to add some serious horsepower to ejected particles. Except (and you knew there was going to be an "except"), the active galactic nuclei are too far away to produce cosmic rays that reach Earth. At the ludicrous speeds of an ultra-high-energy cosmic ray, cruising through the cosmos is more like trying to plow through a blizzard. That's because at those speeds the cosmic microwave background — the flood of low-energy photons left over from the very early universe — appears highly blueshifted toward higher energies. So, that high-intensity light smacks and swats at the traveling cosmic ray, slowing and eventually stopping it. Thus, we shouldn't expect the most powerful cosmic rays to travel any farther than a hundred million light-years or so — and most of the active galactic nuclei are much, much farther from us than that. Part of the problem is that the Milky Way’s own magnetic field subtly alters the trajectory of incoming cosmic rays, disguising their original directions. So, to reconstruct the source of a cosmic ray, you also need models for the strength and directions of our galaxy's magnetic field — something we don't exactly have a full handle on. If the OMG generator is not Centaurus A by itself, then perhaps it's the Seyfert galaxies, a certain galactic subclass of generally closer, generally weaker (but still insanely bright and strong) active galactic nuclei. But again, with not even a hundred samples to draw on, it's hard to make a rigorous statistical determination. Perhaps it's gamma-ray bursts, thought to emanate from the peculiar cataclysmic end to some of the most extreme stars. But our understanding of the physics of that situation is (can you believe it?) kinda sketchy. The true origins of these ultra-high-energy "OMG" particles are tough to pin down, and despite almost 30 years of detection history, we don't have a lot of firm answers. Which is fine — it's good to have at least some mysteries left in the universe. Astrophysicists could use some job security, too. Learn more by listening to the episode on the "Ask A Spaceman" podcast, available on iTunes and on the web at http://www.askaspaceman.com. Thanks to hchrissscottt for the questions that led to this piece! Ask your own question on Twitter using #AskASpaceman or by following Paul @PaulMattSutter and facebook.com/PaulMattSutter. Follow us @Spacedotcom, Facebook and Google+. Original article on Space.com.